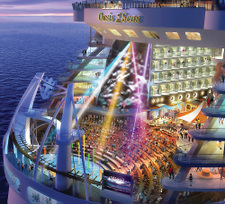 The first innovative feature of the Oasis of the Seas is the Boardwalk. But before we talk about this, we have to introduce a term that is new to cruising: Neighborhoods. 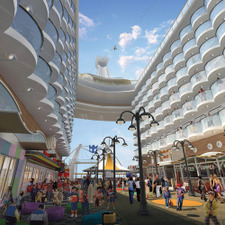 The Oasis of the Seas is divided into Neighborhoods like a New York is divided into buroughs. 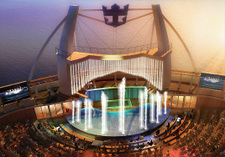 This gives the ability to people to feel they have entered a new world as they meander around the ship. The Neighborhood concept also gives people to "fit in" to areas that make them the most comfortable. Each Neighborhood has places to live, places to eat, and places to shop. There is daylife and nightlife. 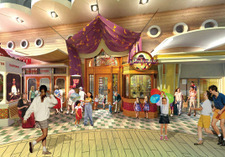 The Oasis of the Seas Boardwalk is designed around families. It is like a boardwalk in Venice Beach or Coney Island (without the sand of course). There is even a Carousel! Also for the children are places for cotton candy, ice cream, games, Madame Zamara's Pyschic and Tattoo, Johnny Rockets, a donut shop, the Seafood Shack and the AquaTheatre. Also on the Boardwalk and next to the AquaTheatre is the Rock Wall!